From the tree, you can edit the schedules you are authorized to access. Right-click the schedule you want to edit and select Edit. If the user is authorized to use the Advanced Scheduling tool, the Advanced Scheduling tool is used to edit schedules, as shown in the following image. Note: The Email and Print distribution methods support multiple tasks. Make the required changes to the schedule. For details on the Basic Scheduling tool options, see Creating a Schedule in the Basic Scheduling Tool. If a schedule already exists, the existing schedule runs as previously defined, regardless of the changes. 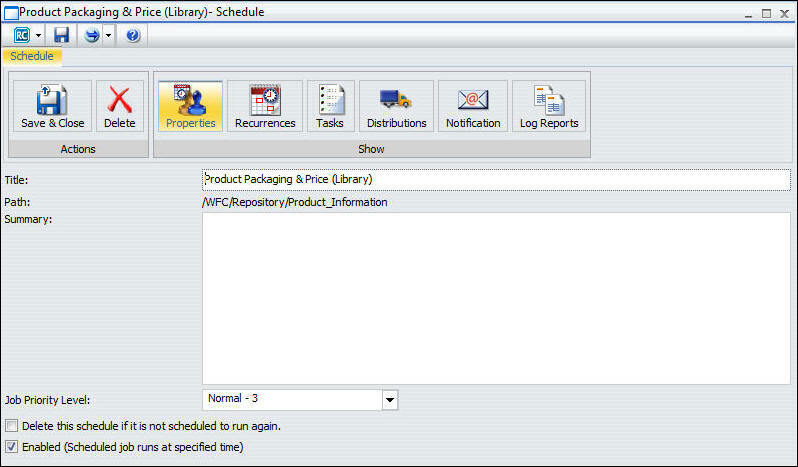 When you open a schedule that uses unavailable options, such as a distribution method, information is displayed that describes the change or changes that you must make for the schedule to use available options. Changes to the schedule cannot be saved until the schedule uses available options. If you selected Run once for the run interval, the schedule runs immediately unless you change the Start Time to a time later than the current time. All other run intervals run at the next primary run-time interval of the schedule. You must save your changes in order to be able to run from within the scheduling tool. If you want your selected schedule or schedules to run immediately, click Run.